We regularly feature handy, interesting apps from the Ecwid App Market on our blog to help you find something to complement or supplement Ecwid’s e-commerce features. 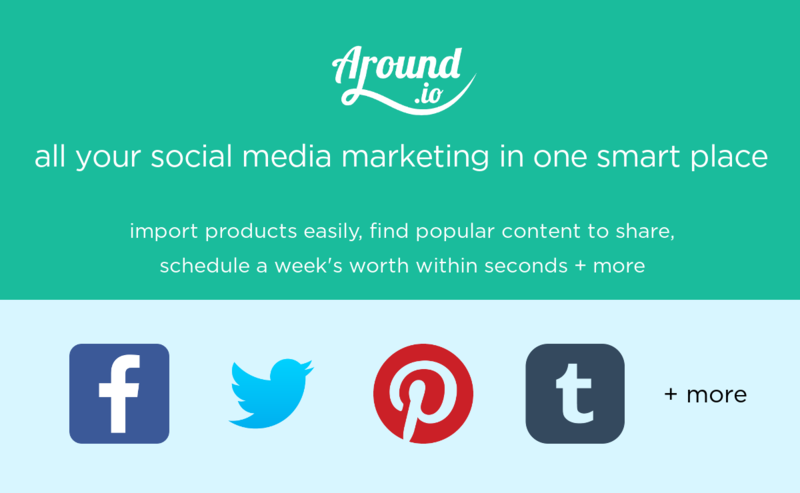 Today we’re featuring Around.io, a smart social media marketing app for your Ecwid store that saves you 15-30+ hours of work every week. The app lets you schedule posts to your Facebook page, Pinterest boards, Twitter account and other social channels in a matter of seconds with its Day Planner and Week Planner features. Around.io integrates completely with your Ecwid store so you don’t have to import or copy-paste product images, links, descriptions etc. Besides the one-click Day / Week Planners (that literally save you a lot of hours of marketing effort), the app also features a lot of content curation features that are very relevant and useful in social media marketing. Businesses that spend a lot of time on social media reap the benefits in the form of brand, popularity, traffic and eventually sales. Small businesses spend about 16-20 hours on social media every week and that time is increasing every year as SMBs realize the value of social media marketing in ecommerce. While not everything can be automated or outsourced (for instance, replying to comments), there are certain social media activities (like coming up with content to share, scheduling a day’s posts etc.) that can be automated. Around.io is that tool which helps you market on social media smartly. If you’re leveraging social media to build your brand and increase traffic to your shop, you can save many hours of work through Around.io. Easy, 1-step integration with your shop without any hassle. Day and Week Planner – create an entire day’s or week’s social media posts (promoting your products interspersed with non-promotional content) with a single click. Built-in content curation which makes it easy to find all the popular / trending content in any given niche. You can also keep track of all your favorite blogs with the RSS feed reader. And you can spice up your social profile with funny GIFs searchable and shareable right from within the app. Ability to quickly edit any of your scheduled posts easily. Integrates with Facebook, Pinterest (two of the most popular social channels for ecommerce) and Twitter, Tumblr, Stumbleupon, Google+ and Wanelo. How do I install the Around.io app? Go to the Around.io app page in your control panel and, if you’re using Venture plan or higher, click Get App and you’re ready to go! Around.io has two plans — the Basic Social ($9.99/month) and Advance Social ($19.99/month). You can try all plans free for 7 days before picking up a plan that fits your need. The Basic Social features the Day Planner (one-click scheduler for all your social media accounts), content discovery, GIF search, feed-reader (track latest posts from your favorite blogs). The Advance Social features a Weekly Planner (one-click scheduler that schedules posts for an entire week) along with all the features in the Basic Social. Check out and try Around.io here.